Raspberry Meringue Pie — What the Fruitcake?! And met a violent death as Miss Muffet squished the little fecker with her shoe 'cause there was no way she was letting some a-hole spider scare her away from her bowl of raspberry curd! That's how the rhyme would have gone if dear Miss Muffet had been eating a slice of my pie. No word of a lie. I have never understood the love of lemon curd, and as appealing as a lemon meringue pie is to me visually, the proof just isn't in the pudding. I generally don't like lemon in sweet things, never have, but in curd form it's even worse. I find it to be cloyingly sweet, that and with the weird hint of egginess, it's just... gross. Yes. A very grown up word. But I don't know how else to describe it. Before my taste buds decided it would be okay to adventure into new flavour combinations and unusual foods, lemon curd was the only experience I'd had of a curd. I didn't even know there were any other kinds of curd, other than the cheese kind. Because of that, I'd written it off as a food I just would never enjoy, no matter how many times people tried to convince me otherwise. 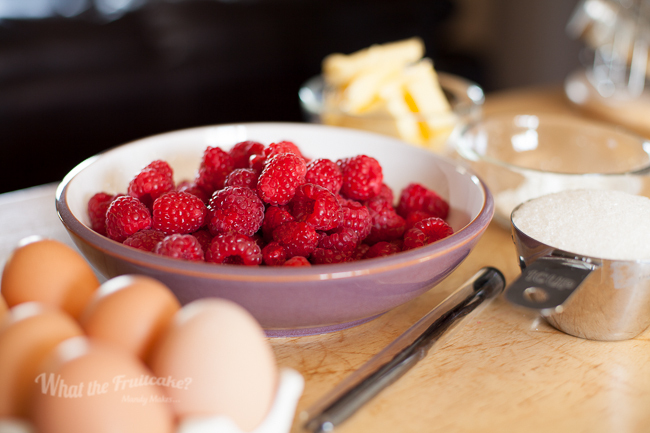 Fresh or frozen raspberries will work, but definitely use fresh when they're in season, you'll get much better flavour! Seedless, if you please. 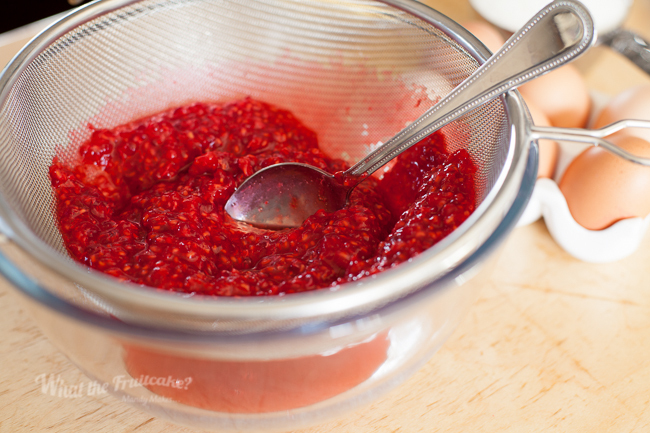 Mash up your raspberries and pass through a sieve to get the juice. All juiced out! 250g raspberries will give you 1 cup (and a bit) of raspberry juice. Best way to bake blind, line the pastry with clingfilm then fill with baking beans or the like. ... making a neat little parcel for you to lift out. Taadaa! To cut a long (and boring) story short, I discovered in my internet wanderings that there were very many other fruit curds. Mango. Lime. Berry. But even after making this discovery, it took a good four or five years for me to actually try any of them. I was just convinced it would still be... gross. That all changed when I had a go at making apple curd for my Apple & Lime Cake. Should you choose to read that recipe's post, you'll see how my mind was changed with regards to curd. How I actually found it to be damned delicious, so long as it wasn't in lemon territory. Truly, I'm a curd convert. So came the month of October, and in October, all things go pink in solidarity with breast cancer awareness. I thought it would be nice for me to do something pink as well. Cupcakes? Nah. Cake? Nah. Tangy and creamy and buttery rich raspberry curd in a sweet shortcrust pastry all topped with the sugary fluffiness that is meringue? Yes. I tell you, I'm often happy enough with the way my baked goods turn out, but it's not often that I giggle like a demented schoolgirl because it turned out so well. This tart (or is it pie?) got the demented schoolgirl giggling. My husband thought I'd read some fantastically dark joke online there was so much demented giggling going on in my "studio". Honestly, I think in all of its simplicity, this is one of the prettiest things I've baked in a girlie girl way (and I'm no girlie girl). And beyond that, so damned tasty that even though you're registering how rich and sweet it is with every bite, you just want more! Another thing that made me happy was with the way it had come together, and that's because the first time I ever baked a lemon meringue pie, it very nearly brought me to tears. I was so damned embarrassed that I told Andrew to pull the car over, there was no way in hell that I was serving this pie. We put it in a plastic bag and shoved it in the boot. When we arrived, still highly embarrassed (and with gross looking stains on my jeans) I admitted defeat and that the pie wasn't fit to be served and I explained why it had failed. Somehow, my hubby's mate's mum convinced me to bring it in from the car. She went on to serve it up and declared it one of the best lemon meringue pies she'd ever had. I was pretty sure she was lying, even through her second helping, just to make me feel better. That day when I got home I went on a mad Google frenzy; "weeping lemon meringue" came back with many tales of meringues turning into syrup, or was it egg whites going back to their liquid state...? Whatever people called it, it wasn't a new thing. In some posts, I even read how it was so normal that it wasn't thought of as a fail, just something that happens to all lemon meringue pies. But, I just couldn't buy that. Every lemon meringue pie I had come across was never a weeping mess. At least, I didn't think so. Whatever the case, I carried on my Google attack and found pages upon pages on "how to stop lemon meringue weeping". So with different advice from many pages, I've combined methods and tricks so that this (not gross) raspberry meringue pie doesn't leave you weeping. So yes, I bake the crust until it's done. Yes, the curd goes in and is left to cool completely. Yes, you have to go "the long route" and make Swiss Meringue. Yes, you get to use a kitchen torch (YAY!). But, it's all so that you don't get left with suspect looking white-ish stains on your table cloth from sugary eggy liquid seepage. You're welcome. Oh, and yes, I realise it's not October any more. Sorry about that. But I did think pink! Add the egg and use a fork to mix, then use your hands to lightly bring all the ingredients together. If using a food processor, pulse until ingredients form a ball. Can be stored in the fridge for a day or two, but this involves sticking toothpicks in the crust then draping clingfilm over the pie so that it doesn't touch the meringue. It's doable, but I suggest eating it on the day instead. Now, I did say that this was weep-proof, but even with my best intentions, I did find that there was a very very small amount of weeping the next day when I took it in to work. I put that down to humidity and the sugar in the meringue deciding to spite me. But, it's at least weep free on the day! 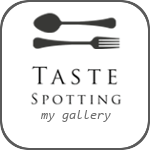 Posted on November 3, 2014 by Mandy Mortimer and tagged Curd Tart Pie Meringue Raspberry Breast Cancer Pink Baked Sweet Dessert Swiss Meringue Raspberry Curd.